It’s probably human nature to want to understand why. I’m no different. Life should be going great for me, yet I find myself plagued with the same old problems. To say it’s frustrating is sometimes an understatement. As I’ve said before I don’t have a full grasp of the Athenian calendar, but I choose to honour Ares with a regular libation this month. This year it will fall near to Veteran’s Day… hhhmm… appropriate. Maybe this would be a good time for me to meditate & try to get a handle on the nature of war & strife. He’s typically painted in a bad light, but who was he really?? There had to be more to him than that. Let’s start with the basics. Ares was the son of Zeus, king of the gods, & his consort Hera. Although he has come to be known as a god of war, it might be more correct to view him as a god of bloodlust, masculine strength, & the joy of slaughter personified. Thanks to his ruthless & aggressive nature all Olympus despised him. As much as Ares has a reputation for being a hot-headed, temperamental jerk, remember that his impulses are often tempered by gentle love. One of his best-known consorts was Aphrodite, goddess of love, sensuality, & beauty. She was hardly a faithful wife to smithy god Hephaestus at the best of times & the masculine allure of warrior Ares was too much to resist. Once solar Helios spied Ares & Aphrodite enjoying a secret tryst, which he reported to her husband. Hephaestus thought to shame the lovers & catch them in the act, so he fashioned a magickal net. He’d invited the rest of Olympus to watch. The trap was sprung, catching the pair in an embrace. Some commented on Aphrodite’s beauty, others remarked that they would be more than happy to trade places with Ares any day. One they were freed, an embarrassed Ares retreated to Thrace. Although his half-sister Athena was also considered a war deity she embodied strategic warfare, whilst Ares tends to act on unpredictable impulse & violence. He’s a thump 1st, ask questions later kind of god. His temperament has lead him into strife, certainly. Once two giants of the Aloadae shackled him in chains & imprisoned Ares in a bronze urn for 13 months. Female compassion came to his rescue again. The young giants’ stepmother Erioboea told Hermes what happened. emis tricked the Aloadae into slaying each other & Hermes rescued him. Ares gave more to the Hellenes than just the strife of battle. He left his mark on the on Greece by playing a role in the founding of Thebes. 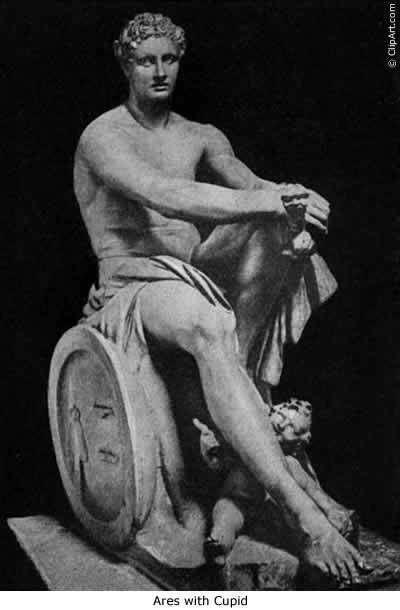 Phoenician prince Cadmus travelled to Thebes after following a cow after the oracle at Delphi instructed him to found a city wherever the beast should stop. Cadmus wanted to sacrifice the cow & sent his men to fetch water from a nearby spring. The spring was guarded by a dragon that slew many of the prince’s men before Cadmus could kill it. The creature was thought to be sacred to Ares. Athena intervened, giving Cadmus half the dragon’s teeth & telling him to sow them like seeds. He did so & from the earth sprang fully armoured warriors. Cadmus threw a stone because he feared them. The warriors, thinking that the stone had been thrown by one of the others, fought each other until only 5 remained. These helped Cadmus to found the city of Thebes, although Cadmus was forced to serve Ares for a year to atone for killing the dragon. At the end of his servitude he was given Harmonia, daughter of Ares & Aphrodite, for a wife. Ares might be harsh, but he is ultimately fair. He rewards those humble enough to own up to their mistakes. Here harmony comes at the end of struggle. Remember that Deimos ( dread ) & Phobos ( fear ), his sons by Aphrodite, often follow their father. Also amongst his attendants is the goddess of strife, Eris. War in & of itself doesn’t have to be a bad thing. Sure, his methodologies might be a little hard to take. Ares can also provide that fire in the belly that causes us to boldly act where logic might fail us or our insecurities might keep us rooted to the spot. He also blesses men with courage in difficult situations of all kinds. He might not be everyone’s idea of a positive deity, but I’ve come to appreciate him as the force that empowers heroes of all sorts, be it a soldier on a foreign battlefield or a policeman doing his duty to keep our streets safe. It’s often that which accompanies him that causes discord. Let’s face it, more often than not we do it to ourselves. It’s a natural reaction to fear change forced on us before we feel ready. It’s completely normal to look at this huge mountain of an obstacle in front of you & tremble. The passion of Ares shows us the way through. Most acts of creation aren’t pretty. Think of the act of giving birth. It’s violent & messy. It can be hard to remember what joy will come at the end of things in the midst of the pain. Ares shakes up our lives, no doubt. It is sometimes necessary to keep us from getting stuck in mental or emotional rut. He sometimes needs to drag us kicking & screaming to where we need to be, but ultimately it is for our own good.